Newbie question. Previously I have only ever lathered on my face directly off the stick and after joining here have decided on trying a bowl.I have an old mortar bowl (as in mortar and pestle) made from marble that had a chipped base/stand that I cut off,it's 55mm deep,pretty steep sides as it is a mortar after all, and 80mm wide on inside edge at top. I tested my new brush in it and the lather keeps rising to the top and basically,overflowing. Does this happen with most bowls? Or have I made a newbie mistake using a non suitable vessel? A 'dedicated' lather bowl or scuttle will have ridges in the bottom to heap in the lather making process. I'd also suggest the marble is just too slippery. Note the ridges on the bottom. I bought it from Whispers From the Woods, when they were at the local markets. @pvsampson to answer your question. Yes it does and will. 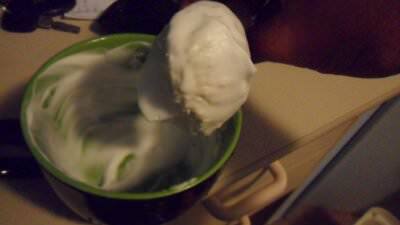 As you create the lather in the bowl it will want to crawl up the sides. This is a technique thing that you'll get over time where you can make the lather stay where you want it. 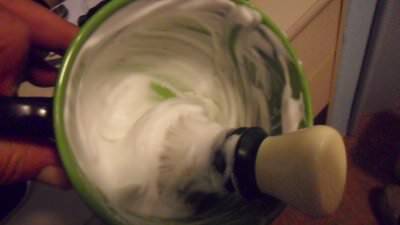 As you have noticed most lather bowls are and have ribbed or textured sides or bottoms to aide the production of lather and you can easily do without them but it helps a lot. That size and shape of the bowl will matter and to you alone as it is a technique, brush size, soap and hand size/handicap thing. However most of the lather bowl designs work the way they are intended. 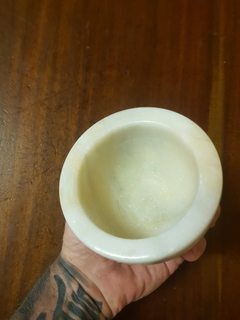 Inside of bowl isn't polished. I think the narrow bottom conical shape forces the lather to rise,and just keeps pushing it up. Just too small internally to be a decent bowl,which is a shame because I like the stone. I will play with it and if I can't get it right then look around and find something to use. May pay a visit to a monumental mason and see if I can get a decent stone slab then make a bowl myself. What I'd be concerned about when using a mortar bowl, is the sandpaper like finish of the surface (like mine have anyway). The shaving bowls and scuttles I've seen, have ridges and aeration points, but are still a smooth, sealed surface. I'd be concerned that the rough surface might act a bit like sandpaper and hurt the tips of decent brushes. That's a good point.There are sealers available,like a liquid glass but getting ridges/bumps on the bottom would be the difficulty in the grinding process,though I have a wheel I could do it with. Need to think on it as I will make one.Just a matter of waiting for the right piece of stone to show up. +1 for what @RustyBlade said. See my SOTD post for today, I'm using a plain small breakfast bowl a fair bit for lathering at the moment. I also have two other scuttles that are ribbed. You can lather in anything just got to find what suits your technique and also the soap and brush you are using. Went to the big smoke today,well big for us anyway.Had a look around,even have a Shaver Shop but didn't see anything I could justify spending money on,but I bought some styptic liquid just in case I may need it.Even went to an antique store to try and find a decent bowl but the prices he wanted for even a basic pottery job were a bit high. 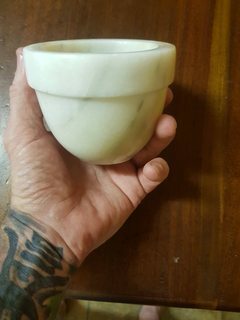 I'll use an old soup cup I have for the time being as the marble is too harsh.Thanks for input everyone. 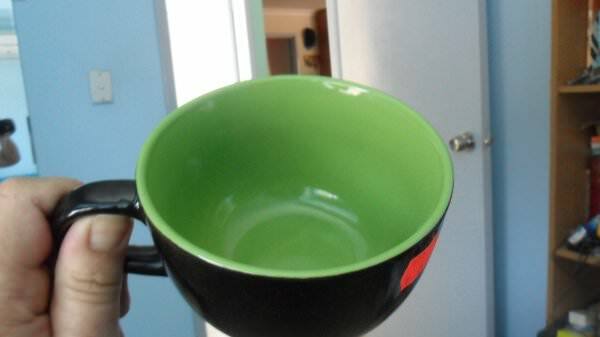 I was at red dot yesterday and they had a huge mug with handle for $3. I was tempted to get one myself as it was 4-5" in diameter. Way bigger than the old soup mug I used to use for boar/horse lathering. Normally I would face lather if using badger brush and a decent soap, but I used to use a mug like this with boar brushes and old soaps. Lost the old mug so I needed a new one. A large mug with a handle for grip, something to soak, rest or drain the brush is good enough for me. To add roughage to your red dot special you could superglue some old small buttons or what not in there to texture it up a bit. That was enough for a 2 pass shave and when I washed out the mug there was still about half of the small solid chunk of soap left, so I could have added some more hot water and kept working enough for a 4 pass shave. That worked ok for a basic cup.